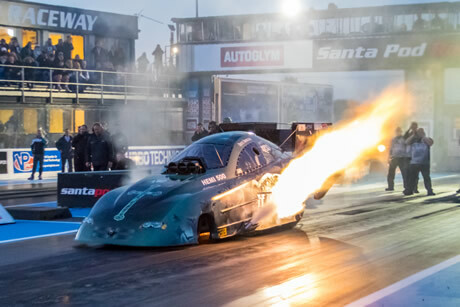 2019 will see the return of points scoring competition for AA/FC at Santa Pod Raceway as the European Funny Car Series gets underway again with 4 cars competing over 4 rounds. As the drivers prepare for the upcoming heavyweight battle, we caught up with them for a few words. Kevin Kent is raring to go for the new series opener at Easter. “We go into the season with the low ET from the season before and I intend to improve on that. 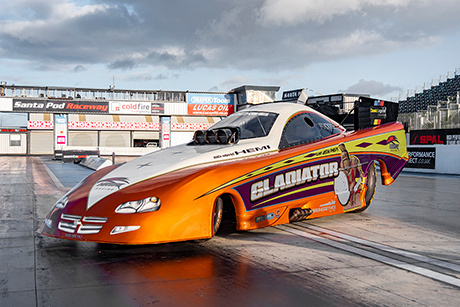 Funny Car racing isn’t easy and it will catch you out if you’re not completely on top of your game, which is why we are getting advice from Bodie Smith again in 2019. We are happy with the way the cars is running so there will be no major changes in the tune up, we’re pleased to say our sponsors; Graphical Tree, Gold Star Cleaning and West Ten Transport remain with us for the upcoming campaign”. Kevin Chapman had a very positive first season driving a Funny Car under the tutelage of John Spuffard. 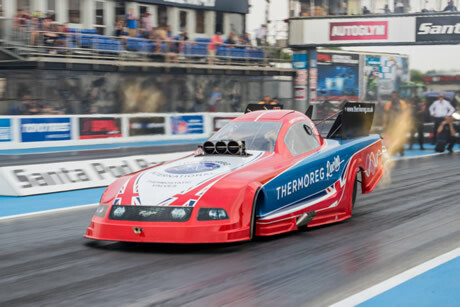 The Thermoreg team are looking to step things up for the points battle in 2019, “We’re going into the season very well prepared and are very much looking forward to the competition. We’ll be getting some expert help with John “Bodie” Smith who will flying in to tune for us again for the 2019 season” Chapman continued “The focus for us is to continue to build on last season which was viewed by all of us as a success”. “Although I’m still the rookie of the class I’m not doing this to come second, the team has their eyes on the prize and I fully intend to be lifting that series shield at the end of the season”. Steve Ashdown will be taking the wheel of the Undertaker car again, tuned by Shockwave Dave Bryant. “We had a tough season last year, it was hard on parts”. Said Steve “But as ever, the whole team is pulling together and we will be competing hard for the 2019 honours. There will be a few changes with updated parts for the 2019 series, we believe we’ve got to the bottom of the problems that caused us so much damage last season, so hopefully, we won’t see a repeat performance” Steve Continued “For me the European Funny Car Series is a big thing and I’m so glad it’s back, I thrive on competition and want to win points that add up to mean something at the end of the season”. The keen eyed among you will have noticed the two Kevin’s are sharing a tuner for the series. The same happened last year but this time it’s for points not just bragging rights. So what will happen if Chapman meets Kent in eliminations? “It will an interesting scenario for sure”, said Kent “Bodie will put a good tune up in both cars so hopefully it will come down to driver ability”. It will certainly add a fascinating dimension to the pairing when it comes up during competition. Chapman says that he needs to brush up on reaction times. ”Getting used to the sheer violence in the car was my first job and being sharp on the lights took second billing, now I know I have to be quicker at the tree if I’m going to compete”. An interesting twist to the season will be something special for Bug Jam, at the request of the drivers the 3rd round of the series will be run over the ¼ mile instead of the usual 1000ft distance. Kevin Kent said “Personally it’s something I’m really looking forward to, most of the old school drivers prefer the traditional distance of the full quarter so we’re pleased to see it back for this special occasion”. There is also some unfinished business between Funny Car and the quarter mile at Santa Pod, the 4 second barrier for AA/FC remains in-tact, Top Fuel broke the 4 sec barrier back in 1998 but for one reason or another the magical four has proved elusive for the class, John Spuffard coming closest with a 5.05 in 2009. So there will be a one off chance for one of the four Funny Car racers to tick the box for this long outstanding landmark, nobody doubts it can be done but will it all come together for Bug Jam? The cars are all capable of running a 4 in the ¼ mile but who will it be; Kent, Chapman, Phelps or Ashdown? As allways, Bug Jam looks like it will be a load of fun. 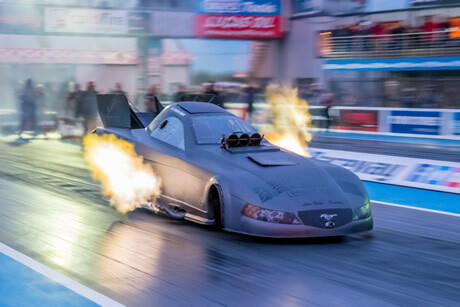 Funny Cars originated in 1960s America when venturesome drag racers began merging nitro-burning dragster powertrains with passenger-car bodies and created an instant sensation. Originally dubbed Factory Experimentals, their altered wheelbases and protruding engine parts made them look ‘kinda funny’, commentators said, and the description stuck. The emphasis lies firmly on ‘funny peculiar’, not ‘funny ha-ha’. Modern Funny Cars still share the same engines as Top Fuel Dragsters, nitromethane-fuelled powerplants packing an 8,000-horsepower punch. Funny Car bodies sit on tube framed chassis and hinge at the back to allow access to the engine and drivers seat, their composite-material bodies might nowadays bear just a slim resemblance to the production cars on which they are modelled, but production-car bodies are not designed to hit 300mph in five seconds flat from a standing start. Channelling such groundshaking force through a short wheelbase makes a Funny famously hard to handle – the racetrack may be straight but the cars often have other ideas.